The carpet spread here with abstract pattern derived from Zaha Hadid's 3D painting, consisting of deconstructive lines and structural changes of color blocks, gives the space another distinctive attraction of personality. In recent years, China Resources constantly explores the ways to cross over boundaries among commercial, residential, artistic and humanistic territories in their projects in Qingdao, as well as all over the country, which somehow coincides with our design philosophy. LSDCASA believes, the arena full of breakthroughs and innovations is always supported by kinds of order and rules, only the one who makes good use of rules will get opportunities to go beyond rules. Facing the boundaries in this project, rather than simply pull down or thoroughly break off, we prefer a gentle method of blurring them away, fading out, to create a new scene, where visitors can enjoy a flexible space through indistinct settings, based on their comprehension, realization and choice. Since the project is built with a stylish, artistic exterior appearance and an interior environment full of futuristic installations, it provides us strong foundation and condition to practice our design. 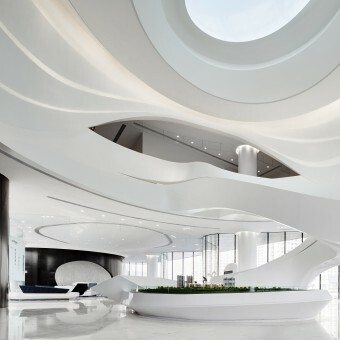 Reception area, the first impression when step into interior space and a starting point to show the disposition of whole space, is principally a display area with streamline ceiling design and intense spatial structure, which delivers a maximum visual impact. On the basis of its own feature of the space, we use modern, streamlined artistic installations here, instead of redundant furnishings, to match the flowing effect, layer after layer, and eliminate the feeling of repression and alienation that may arise from the space of this kind. By such a way, we blur the boundary between space and people, and connect them together. Art works take such an important role in this project that are applied through the whole space, even confuse its definition with furniture. 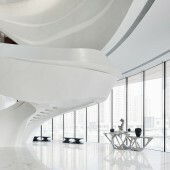 On the selection of artistic installations, each artwork is required to has a modern, streamlined appearance to meet the flowing feature of the space, as well as same rhythm and metrical sense in the form, before standing in its place on the basis of serious consideration and accurate measurement, with an attempt to guide visitors’ moving route and shift their attention. 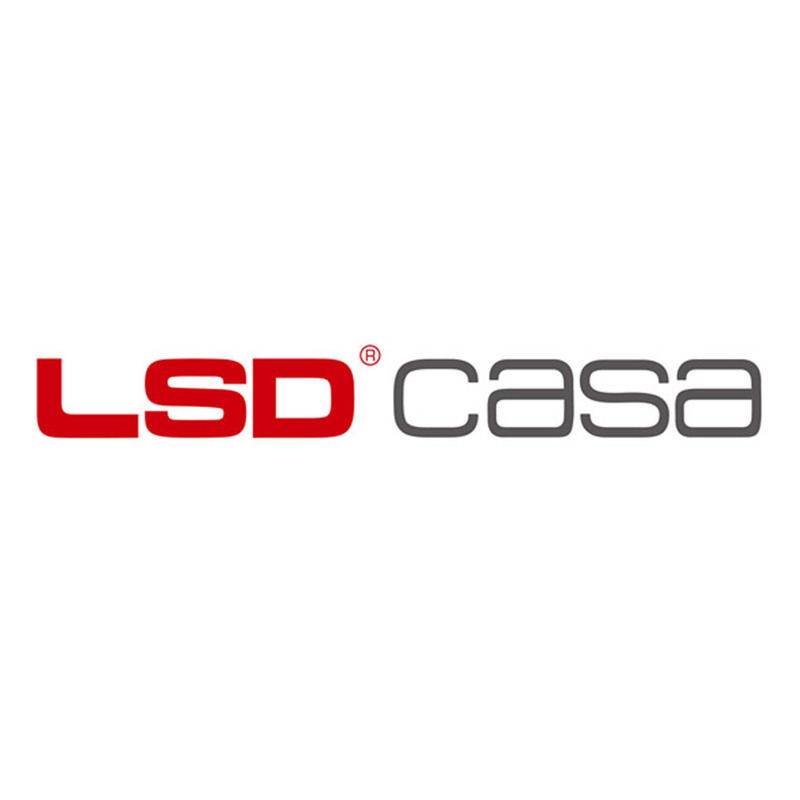 LSDCASA was set up in year 2007, comprising three parts of business: soft outfit design and engineering, global procurement for home furnishings, one-stop home solution platform: reforging. 01. Soft outfit design and engineering Providing soft outfit design including premium customized design to real estate developers and individual customers including hotel, mega businesses, clubs, villas and sample apartments. 02. Global procurement for home products We have built up globally a premium platform for home product brands based on our extensive network of home products and artistic products. 03. One-stop home solution - Reforging Our core products include reforging home and reforging package. New products release for the first reforging was held in year 2015 in The Twentieth China International Home Production Exhibition (Shanghai). The Yizhan Store is open and the OCT Experience Center will be open soon. Qingtie Cr Town Sales Office Sales Office by Kot Ge-Lsdcasa and Studio Hba is a Nominee in Interior Space and Exhibition Design Category. · The profile and other works by Kot Ge - LSDCASA and Studio HBA is also kept secret. This information will also be available later. Qingtie Cr Town Sales Office Sales Office by Kot Ge-Lsdcasa and Studio Hba is Winner in Interior Space and Exhibition Design Category, 2017 - 2018. · Press Members: Login or Register to request an exclusive interview with Kot Ge - LSDCASA and Studio HBA. · Click here to view the profile and other works by Kot Ge - LSDCASA and Studio HBA. Did you like Kot Ge-Lsdcasa and Studio Hba's Interior Design? Did you like Qingtie Cr Town Sales Office Sales Office? Help us create a global awareness for good interior design worldwide. Show your support for Kot Ge-Lsdcasa and Studio Hba, the creator of great interior design by gifting them a nomination ticket so that we could promote more of their great interior designs.